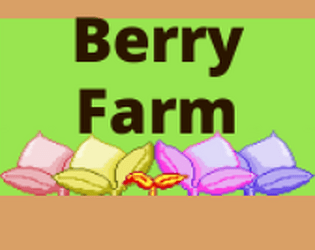 Berry Farm is a compact game that requires only the mouse to be played. 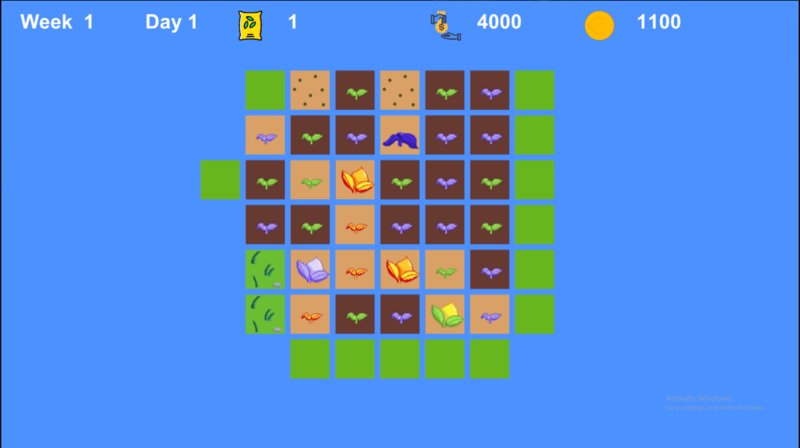 The player plants and harvests berries to earn money. They can make the berries into seeds to make more berries or sell the berries for money to pay off a loan at the end of each week. 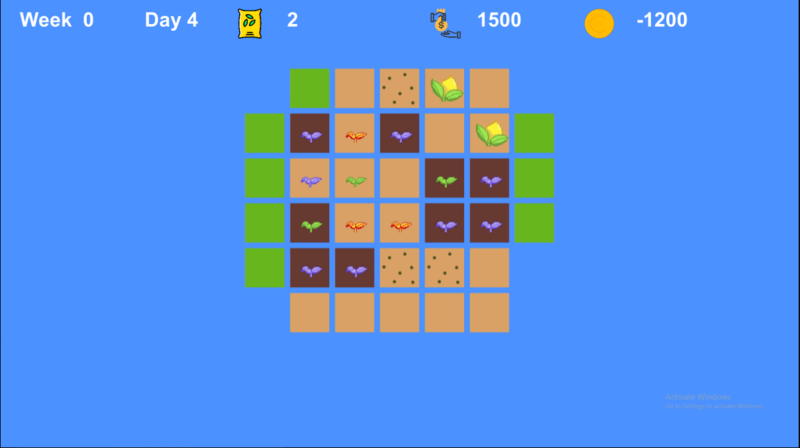 The player can also buy more land to plant more berries more quickly. The game starts off slowly but becomes a frantic clicking game after a few minutes. Think the mechanic wasn't very clearly communicated through the graphics (although understandably it was 48 hrs) and it wasn't intuitive that the berry needed watering every time the ground went light brown, even when it was in a single day (don't think plants die immediately if you don't water them multiple times a day). Once I got the hang of it though, it was a pretty fun frantic game of clicking. Agree that the relaxing BGM felt kind of out of place. Nice sound effects and game loop! That was... surprisingly addictive! That gameplay loop kept me hooked for far longer than I'd like to admit! 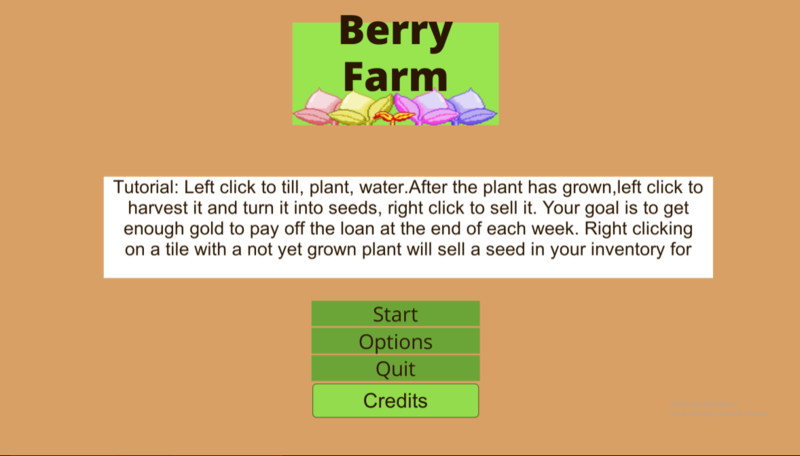 I like how we can decide how fast or slow to farm by choosing to sell or harvest the goods, leading to this balancing act of having enough plants growing, but not too many at once... At one point, the calm music certainly didn't fit the frantic clicking I was doing! You have a gem on your hands, even though it doesn't quite fit the theme! Good job! This is quite a nice little game. It felt a bit slow paced at the beginning but it picked up the pace and was actually quite fun! I'm not entirely sure if this game fits the theme that well but that's alright. Overall good job! Thank you, any suggestions on getting rid of the slow paced start (especially on repeated playthroughs)? I guess the best suggestion I can give is adding some form of preparation for the chaos that might ensue later. Perhaps having things such as sprinklers and auto-seed planters which could become fairly important later on. Also giving them their own issues such as the sprinkler needing to be watered multiple times, and the auto-seed planters needing to be reseeded. However that's just off the top of my head, I'm sure by testing a few different ideas you could come up with an even better method. I certainly wasn't expecting that from a farming game! I'm happy with what I got, though, as I have a short attention span. I found it amusing how the music quickly begins to sound completely out of place as the action heats up. It would be interesting if it dynamically changed to keep pace with the gameplay, although obviously that isn't something easily achievable in a jam setting. Thanks for the feedback, since the day/night cycle is fixed, i could probably add music that gets more intense as the game goes on without having weird fades or music cutting off.on the you win, im considering adding an endless mode (with no loan repayments), on that note: were the loans you had to repay a important point to how you developed your farm? im trying to figure out how key the loan system is to the game, and if it would be better to just have and ever increasing field with no win (or loose) condition, apart from all your plants rotting. Thanks you very much for the feedback. I didn't personally have any trouble hitting the loan targets, but they were enough of a perceived threat early on that I didn't feel comfortable fully expanding right away. I think you need some sort of ongoing goal to work towards to maintain at least a semblance of strategy, and the loan payments were perfectly adequate for that in a game jam scope. I was mostly surprised it wasn't already endless with an ever-increasing loan target. We are definitely considering endless mode, but i feel like the loans will be hard to balance since they cant be linear (x+2000 for example), they have to take into account the exponential expansion that happens especially in the early part of the game.